I was listening to a motivational video by motivational speaker, Les Brown that urged the listener to live in the future. If only for a moment it wanted its listeners to imagine their lives being the way that they want it to be, as the person that they want to be. Les Brown tells us “we have to see ourselves there long before it happens” and urged people that if you are going to fail then fail forward and don’t take two steps back like so many of us tend to do when something doesn’t work out. When I heard this it immediately had me envisioning my life ten years from now and trying to focus on how I can live like I am already there. Ten years from now my Write 2 Be Media Company will be going stronger than ever with, at minimal, ten published books from me and successfully publishing other authors. My company will not only have Write 2 Be Magazine in print and digital form but also two other successful magazines as well. I will have a television show already into production and a couple of movies being optioned. I will have my book store up and running by then as well as my line of Write 2 Be t-shirts and other novelty items well into production. The main thing, one that is truly a project that is vitally important to me, my Write 2 Be Creativity Camp will be successfully operating in the state of Maryland and hopefully beginning to branch out to other states for the encouragement of the arts in our children’s lives as a way to not only enrich their artistic abilities but to foster self-acceptance, self-love, and confidence within themselves in this fight against bullying. There are a few other things that I have in play as well but those are my main focuses and that is a vision that I cannot let go of. I’m not sure that I can so easily live as if I am already there in that moment but I can see where Les Brown has a point of the fact that if we don’t act as if it can ever happen then there certainly is a great possibility that it never will. I think that a lot of times when we fail we want to just give up and stop trying (or maybe that’s just me) but what we need to do is fail forward, meaning learn from that failure and use that failure to progress the next time. The future holds whatever we allow it to hold so if we don’t envision a prosperous future then how can we truly facilitate the future that we say that we want? We are all meant to live a prosperous life but we have to start acting like we want that life. The future is whatever we make it out to be. 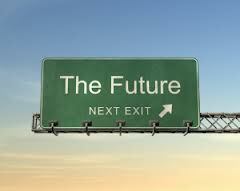 What does your future look like? Okay so I know that I am a few days late in writing this post considering that the most talked about moment in television happened on Thursday night on Shonda Rhimes new show “How To Get Away With Murder”. I really just wanted to take time to get my thoughts together because that moment when Viola Davis removed her wig, and then her false eyelashes, and finally all of her make-up, was probably one of the most defining moments in television history to everyone who watched and in particular, to women and just those who struggle with being themselves on a regular basis. When Davis revealed her true self, or removed all of her body armor as the world is calling it, it was almost as if she was signaling to the rest of the world that it was okay to be yourself no matter what you looked like under whatever mask that you happen to be wearing. This after Davis recently revealed in a speech that she made that she suffered through a childhood of extreme poverty and had at one point in her life felt ashamed of her impoverished childhood. We all wear the masks. Those faces that we want people to see because what’s behind the mask is sometimes just too painful for us to be able to share with others. We want to cover up all the old wounds and scars from every rejection, every discouragement, every ugliness that lies within us. 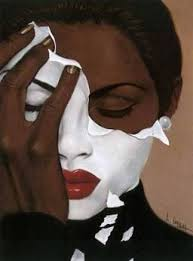 We tend to have this waiting period before we can reveal our true selves to people before we can take off the masks that we have been wearing far longer than we care to admit. The thing is if we are only revealing our true selves once we’ve decided someone has proven themselves worthy enough to get that close then are they really getting to know the real us. I think that if we stop trying to figure out who will and won’t like the real us and stop trying to please everyone else around us we need to be happy with who we are and love our own selves enough to not care if there is anyone else who likes us or not. I know it’s easier said than done because what person does not want other people to approve of them but when us needing others approval interferes with us being authentic to who we are it becomes more problematic. We somehow think that if we are authentic and true to ourselves that the world will disapprove and that people will no longer like us. However, something that I have discovered over the last several years, especially within the context of this blog, is that allowing yourself to be vulnerable to others is really what sets you free and allows you to be who you were meant to be. Vulnerability seems like such a dirty word to most people but if you really think about it, once people see who you really are, odds are, they accept you more. And the people who don’t accept you when you are being your true self aren’t really worth your time anyway. We shouldn’t be trying to figure out all of the ways that we can get away with deceiving others by making them think we are someone we are not. Instead we should be celebrating the uniqueness within us. If we weren’t so reluctant to remove our armor and so concerned with covering up all of our metaphorical scars then we could see the beauty in letting the world see our flaws and we would celebrate those flaws. Those little imperfections are what makes us perfect in our own individuality. The best way to get away with being our true selves is to not give a damn whether anyone else approves of us or not. Be yourself, remove the armor, and trust that who you truly are underneath that mask that you’ve been wearing all this time is enough. The good thing about working on two unfinished projects for National Novel Writing Month is that I don’t have to complete the task of writing an outline like I would normally do for a new project. However the challenging thing about it, aside from the fact that I will be working on two books at the same time, is that they are two different types of books. One book is my novel that I started about two years ago and the other book, which I started working on about nine months ago, is non-fiction, more of a self-help/motivational book for writers. The two projects couldn’t be more opposite of each other so I’m not sure how the contrast is going to affect my production. While National Novel Writing Month will not be new to me, trying to complete two different projects at the same time that are not in the same genres. I am a little more confident about the non-fiction project because I started it more recently and it will be fairly easy to jump back into it. The fiction book, I’m afraid I might have taken too much of a break from that one to just jump back in. 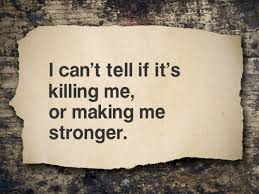 Either way I am determined to make the best of the month of November and to attack these projects as if my life depends on it (they really do, lol). Once November is over and I (hopefully) have my two finished projects I plan to immediately get them into the editing phase so I can get the ball rolling on getting these books published. 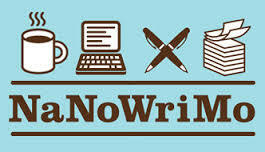 I have my work cut out for me and for any of you who have participated in NaNoWriMo, you already know it is not an easy task to accomplish. 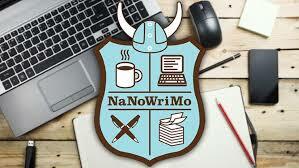 I will share the process with you as it goes along and I hope if any of you are doing NaNoWriMo this month please feel free to share with me your process and how you’re achieving the task. I guess November will be a pretty busy and productive month! Another nugget of inspiration that I took away from the Elizabeth Gilbert sit down she had with Oprah on Super Soul Sunday was when she talked about everyone needing to make a plan to go on their own quest similar to the one she went on in her Eat, Pray, Love. She expressed that everyone’s quest is naturally going to be different but that if you have a desire to go on your own quest you should not let any manner of obstacle stop you from doing so. She told a story of a woman whose mother saved $1.00 a day in a coffee can every day for twenty years until all of her children were grown and on their way and she finally could take the trip around the world that she had been looking forward to taking. Elizabeth Gilbert spoke of getting our coffee cans together and even if life prevents us from going on our quest now, we should still start preparing for the moment when we can go on our quest. I immediately went to my closet and got my coffee can and put a few dollars in there. I have a quest that I definitely want to go on. It was once my plan to have gone on a trip around Europe around my 30th birthday but circumstances and life and motherhood prevented that from happening and four years later I still have not made it to Europe. What Elizabeth Gilbert reminded me of was that just because my trip didn’t happen the way I wanted it, or in the time that I wanted it to, doesn’t mean that it can’t still happen. 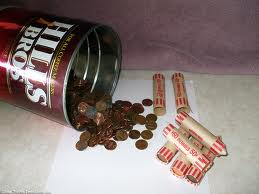 I still want my writing vacation trip around Europe so I am putting my plan into place and I have already started my coffee can savings. I think that this gives me even more to look forward to in my life and it fuels me with even more motivation to accomplish all of the dreams that I have in mind to reach in order to be able to allow things like this writing European trip to happen. The journey is always worth taking, even if you have to save a dozen coffee cans to get to your destination.